Deeply engraved 3/4" round die makes beautifully detailed impressions. Attached to a genuine swirl shape royal blue Murano Glass handle from Italy which measures 2 1/4" tall. 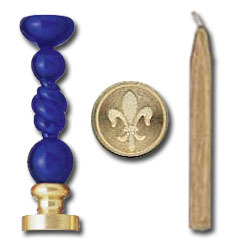 We also include a stick of our premium gold sealing wax. The Fleur de Lys, or “Flower of the Lily,” the emblem of the French Kings, was officially adopted by the French monarchy in the 12th century. This symbol, most commonly derived from the flower of the Iris, was used on the armor of the royal house of France as well as on the clothing of the French kings. Murano Glass from Italy is the most luxurious art glass in the world, following ancient techniques practiced for over 800 years. Murano’s reputation as a center for glassmaking was born when the Venetian Republic, fearing fire and destruction to the city’s mostly wood buildings, ordered glassmakers to move their foundries to Murano in 1291. Murano's glassmakers were soon the island’s most prominent citizens. By the 14th century, glassmakers were allowed to wear swords, enjoyed immunity from prosecution by the Venetian state and found their daughters married into Venice’s most affluent families. However glassmakers were not allowed to leave the Republic. Many craftsmen took this risk and set up glass furnaces in surrounding cities and as far afield as England and the Netherlands. The process of making Murano glass is rather complex. Most Murano glass art is made using the lampworking technique. The glass is made from silica which becomes liquid at high temperatures. As the glass passes from a liquid to a solid state, there is an interval when the glass is soft before it hardens completely. This is when the glass-master can shape the material.